China has the largest population and solid waste generation in the world. Every year there is an increase of 10 billion tonnes of solid waste, and China is still sitting on 60-70 billion tonnes of waste storage. Some cities are literally “surrounded by garbage”. On 21 January 2019, the general office of the State Council took a further step to solving this by publishing the “Work Plan for the Pilot Program of ‘Zero Waste Cities’ Construction”. So what is a “zero waste city”? It doesn’t necessarily mean no solid waste generation. Instead it is more of an advanced urban management concept that aims for more comprehensive utilisation and lower environmental impacts of solid waste. 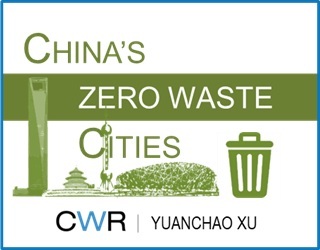 But before we explore the main targets and tasks of the zero waste city work plan, let’s first take a look at China’s solid waste challenge. The generation and treatment of four types of solid waste (general industrial solid waste, industrial hazardous waste, medical waste and urban living garbage) in the last five record years (2013-2017) are shown below. General industrial solid waste accounts for most of solid waste generation. Urban living garbage takes second place with roughly as much as 1/10 of the general industrial solid waste. It’s also important to note that the disposal rate of medical waste and urban living garbage is almost 100%. To achieve a Beautiful China, the government has already issued a series of regulations and policies including the Air Ten, Water Ten and Soil Ten plans, the ban on importing foreign waste, etc. However, as shown in the charts above, the high intensity of waste generation, not to mention frequent illegal dumping means improvements are needed in existing waste management. Zero waste cities is one way forward. Ten cities from different regions, development levels and with varying industrial compositions will be selected as pilots. Pilot cities are supposed to control the increase of industrial solid waste, completely utilise main agricultural wastes and completely prohibit illegal dumping of solid waste. Also, by 2020, an environmental pollution insurance system is to be promoted to relevant enterprises in pilot cities. Third-party enterprises specialising in solid waste utilisation and pollution control are encouraged. So which cities are most likely to be impacted by this plan? The waste generation of a city varies year by year, but there are some cities which always appear in the top ten list of waste generation. We look at which these cities are in each solid waste category below. Ordos (Inner Mongolia) and Panzhihua (Sichuan) are two hotspots which produce the most general industrial solid waste. 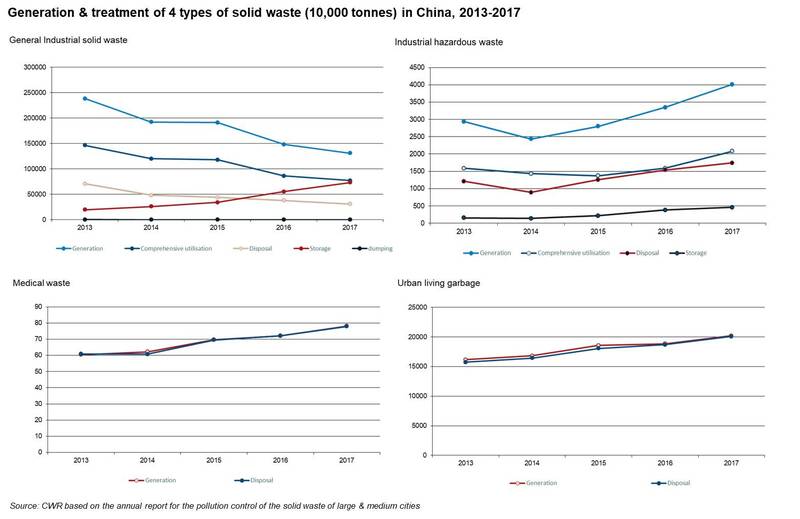 While Panzhihua’s waste generation has kept steady, Ordos saw an increasing trend over the last 5 years and has become the top producer of general industrial solid waste since 2016. For industrial hazardous waste in particular, Suzhou (Jiangsu) and Yantai (Shandong) are the two hotspots. Both cities saw an increasing trend over the period, in which Yantai has become the top producer of industrial hazardous waste since 2014. Beijing, Shanghai, Guangzhou (Guangdong) are the hot cities in medical waste generation, and Beijing and Shanghai have always been the top two cities over the period. A clear increasing trend is seen for all three cities. For urban living garbage generation, the top ten list hasn’t changed much during the last five years. Six hot cities are picked including Beijing, Shanghai, Chengdu (Sichuan), Guangzhou (Guangdong), Hangzhou (Zhejiang), Shenzhen (Guangdong). Beijing and Shanghai have again been the top two cities over the period. An official of the Ministry of Ecology and Environment says that regions of strategic importance, such as Beijing-Tianjin-Hebei (JJJ region), the Yangtze River economic belt and the Greater Bay Area, will be considered first in the pilot city selection. This appears to make sense given most of the hotspots above are in those regions. Although the construction of “zero waste cities” was proposed firstly in China, other developed countries such as Japan, Europe and Singapore have also had similar initiatives in solid waste management. Japan started its circular economy & society plan in the 1990s; while Europe and Singapore have also published their own zero waste plans promoting circular and zero waste economy. For China, there is some catching up to do. Although some measures have already initiated in some regions, it’s still far from enough. But the “zero waste cities” pilot can build on this and be a good exploration for a waste management system “with Chinese characteristics” and a conveyor of green living.